A newly built studio on second floor with own entrance and huge private terrace. Only the stars serve as roof on the terrace that you have all by yourselves. Here you can pick your own fruit and enjoy the lush surronding with birds and butterflies. Here you can have your breakfast under the mango tree surrounded by birds , butterlies and papaya, lemon, guava, coconut, stafeli and lots of other exotic fruit trees. The big terrace is wonderful in the evening and there is a BBQ outside. Jambiani beach is a quiet beach full of cozy small bars to visit. 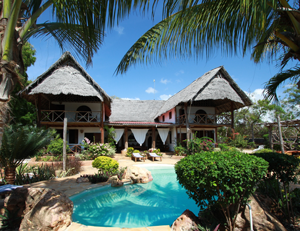 The area is the best for exploring Zanzibar. Contact us if you want some more ideas. 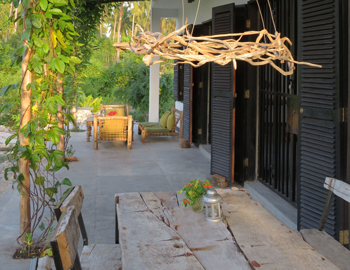 This private villa escape is all yours and you can stay up to 11 pax. 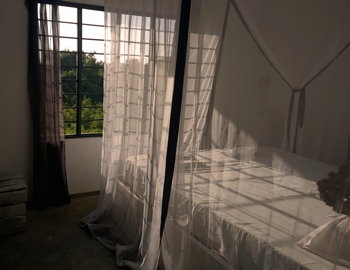 It is located on a secluded beach strip in Matemwe, and from the villa you overlook the ocean. There is a private chef, a pool, a jetty, a BBQ and countless lovely places to sit and enjoy the sea and the tropical garden. Price is from 440 usd/night for 4 pax incl. 3 course dinner.